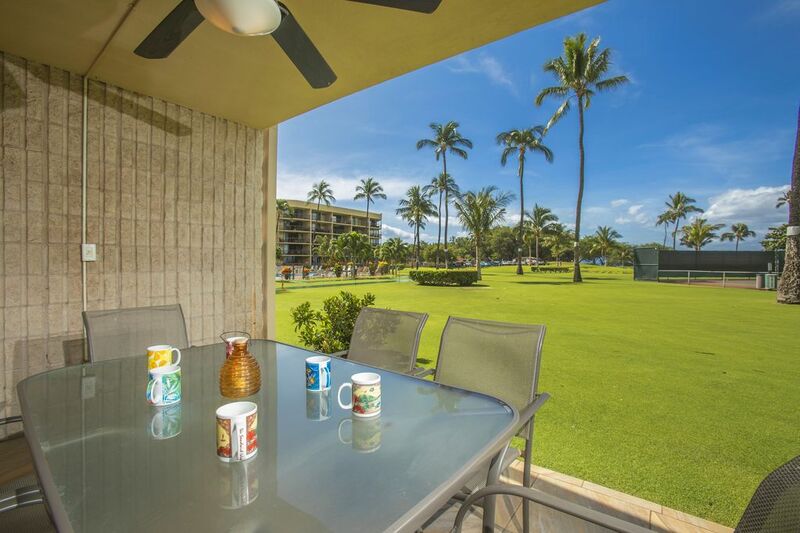 Maui Sunset is a fabulous oceanfront property in Kihei with lush tropical landscaping, a large pool which is heated during the winter months, hot tub, gas grills, work out room and tennis courts out on the beach for your use. Guests return here year after year which says a lot about this property. Windsurf, whale watch, walk the beach and enjoy magnificent sunsets. Unit A122 is directly on the oceanfront. This front row ground floor newly remodeled unit has 3 bedrooms with gorgeous Tommy Bahama linens and 3 full bathrooms. The master bedroom has a king bed, the guest room has a queen bed and the second guest room has two single beds. The unit sleeps 6. This property has a fully equipped kitchen, with all new stainless steel appliances. For your comfort, the condo has A.C. in the living room, all bedrooms, and ceiling fans throughout. This unit is equipped with four beach chairs. For those who need to stay in touch while vacationing, there is complimentary wireless internet service for your use. Note: A $300 refundable security deposit is required for this unit. This property also features shuffleboard, putting green, work out room and tennis courts out on the beach. Loved the location, large enough to accommodate 3 couples nicely, could use some updates. Having the ground floor unit right by the tennis courts and pool was great. Short stroll to beach for sunsets and morning walks. Our first 7 days included scaffolding outside the unit which was unfortunate but the property management worked with us on a discounted rate and, once the scaffolding was gone, we enjoyed our time sitting on the lanai. The unit was large enough to accommodate all 6 of us. Everyone loved having their own bedroom and bathroom and the living area easily fit all of us when we were lounging around. Only "complaint" would be that it needs a little updating or fresh coat of paint and the master bed was a little too hard for me but we were in paradise so it's hard to complain about anything. We would stay here again if all 6 of us are traveling together. It's really the only unit with 3 beds, 3 baths on the beach. And the bonus was the tennis courts which we used daily. Clean and comfortable. Incredible location. The condo has the best location, in my opinion, of any of the condos in the complex. It was clean and comfortable and my kids and in laws loved it. Someone came over to fix the bed and was helpful in answering our other questions. Our stay has been awesome since. Very happy and happy with the response. Impressive facility, and so many amenities! Our condo was large and provided plenty of room for three couples. We enjoyed watching whales from our lanai and sunsets at the beach each night.